As part of it’s ongoing commitment to preserving railroading history and making it available to a wider audience, the Laramie depot is in the process of developing an online digital archive of documents, photographs and interviews. Below are a few examples of the kind of information that will be made available. Thee images may be used for non-commercial purposes, but if publishing or e-publishing them or information based on them, please mention the Laramie Railroad Depot Association as the source. A Freight Conductor's Train Book records the engine, crew, and cars for every train a conductor rides during some period of time, usually one or two months. The train book reproduced here is by a conductor named J.A. 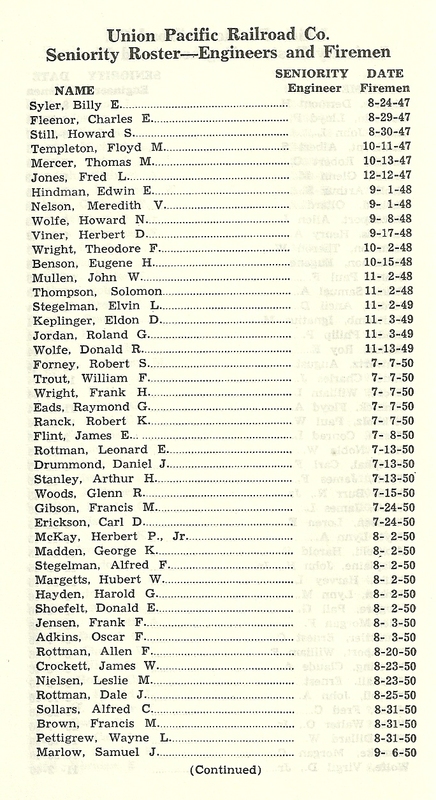 Traud who rode the Laramie to Rawlins,Wyoming, Union Pacific mainline and recorded the trains from October 26 to December 6, 1951. Most conductors kept their records on the lines provided in the train books, but Traud wrote his on separate sheets and then pasted the sheets into the book. The images that follow include every page in Traud's book. The organization is by the train ridden. The date the train departed is to the right of the link. 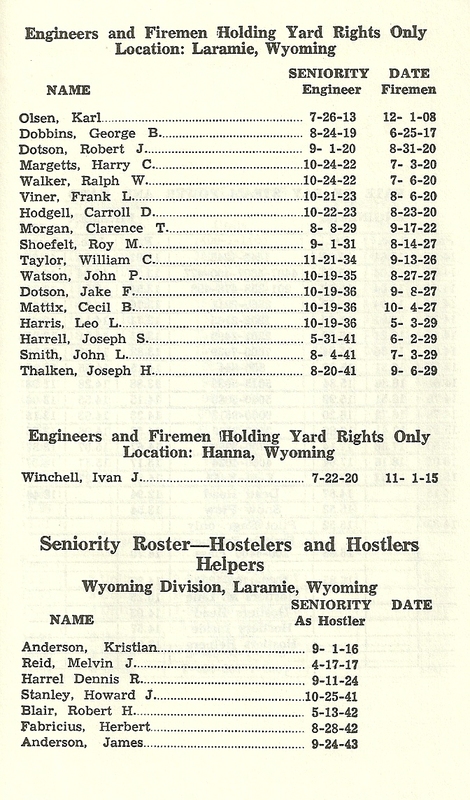 First there is an overview of the train - the time and place it left and arrived (Laramie is "566" and Rawlins is "683", meaning mileposts 566 and 683), the engine and caboose numbers, the names of the crew, etc… Then there are the records for the individual freight cars - road name and number, weight, content, destination, etc… For most trains there are two images of car records and they usually overlap. Please note that the cars are listed in reverse order: the first car listed is the last freight car in the train, just ahead of the caboose. You may download or use this Excel file for any non-commercial purposes you wish, but you do not have the right to copy it or portions of it to any other website without the written consent of the Laramie Railroad Depot Association. If you publish or e-publish information based on it, please mention the Laramie Railroad Depot Association as the source. The Laramie Railroad Depot Association Library is a non-circulating reference collection of railroad books and videos. 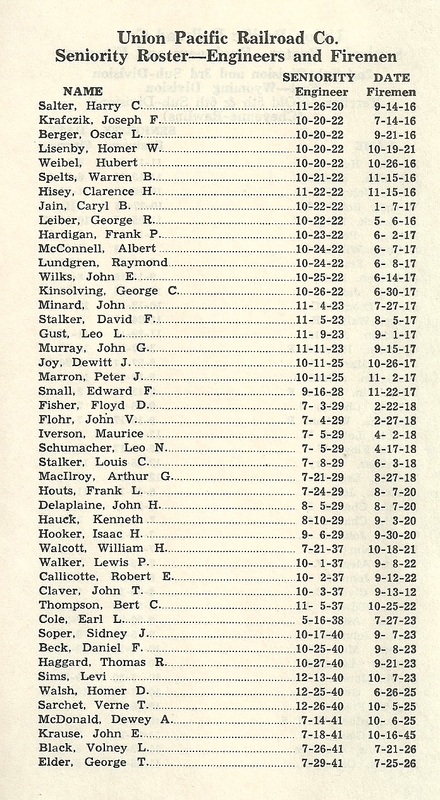 The library catalogue can be browsed online at: http://www.librarything.com/catalog/LRDA. Bookshelf located in the museum. The Depot’s collection continues to grow throughout the years. The library grows primarily through the donation of books and cataloging by volunteers.